Watching the eBook revolution take place right now means a front row in the history of the printed word – and I’m enjoying it a little bit too much. As the publisher of a small publishing company, I’ve struggled to find a way to get distribution on the widespread level that larger publishers enjoy. A larger publisher gets its books into stores nationwide on the brand name premise. I’m relegated to pages of detailed marketing plans and concepts (even after nearly 7 years of business), and if store buyers like it, the orders are small. But not anymore. It doesn’t take a Ph.D. librarian to understand how eBooks level the playing field for independent authors and small publishing houses. In a word? Distribution. (Of course, how will distribution occur when there are no B&N’s or Borders? That’s a post for another day.) But it’s not just leveling the field – it’s actually tilting it in favor of the little guy. Yes, this is the publishing world’s version of Rudy … except Rudy is going to be the star quarterback, not a special teams grunt relegated to mop-up duty. 1. Larger publishers are living in denial. Today publishers of larger houses are resigning themselves to the fact that the eBook revolution has arrived, but they refuse to believe it’s happening as fast as it is. Take Thomas Nelson’s Michael Hyatt. Despite predictions that eBooks will surpass physical book sales in two years by booksellers like B&N’s Marc Parrish, Hyatt makes a list of why it will be slower than everyone thinks. But saying it won’t happen fast, won’t make it so. Over the past six months, I’ve seen Ampelon’s eBook sales rise dramatically to where the ratio is 40-60 of eBooks to paperbacks right now, while the net revenue is somewhere around 35-65. Think that’s not fast? A year ago, eBook sales made up 5 percent of Ampelon’s sales. 2. Larger publishers think eBooks are like iTunes. Digital music sales still haven’t overtaken CDs, so larger publishers point to that fact with some comfort that it’s going to be the same with books. However, when it comes to digital music sales, that’s a distinctive factor that doesn’t translate to books – you can buy just one song of an album. Many people (myself included) like to cherry pick the best songs as we all know most albums contain a handful of stinkers you’ll never listen to—so, why waste your money? But books are another animal. It’s all or nothing. And when it comes to the “all” part, consumers are more willing to purchase lower-priced books and take a chance on authors they wouldn’t have in the past. Once they realize that there are some good authors writing for smaller houses, too – and they can buy their books for less – they’ll cherry pick which books they want to read, which will often be the lower-priced ones. 3. Price drives consumption. One of the reasons larger publishers think eBook sales are not a big deal is because they aren’t seeing it. When Amazon adjusted its royalty structure to 70% for eBooks priced between $2.99 and $9.99, almost every large publisher immediately priced their books at $9.99. And consumers aren’t ready to get on board, much like they’re reluctant to pay for content on the web that they’re used to getting for free. Only established authors with large publishing houses are getting top dollar for their eBooks, but eventually the stable of those authors is going to run out. Then what? Take a look at Vincent Zandri’s book The Innocent. Zandri took a book published 11 years ago by Dell that had disappointing sales numbers, retitled it, and pushed it through a small publishing house StoneGate Ink, a subsidiary of StoneHouse Ink. In the past six weeks, Zandri has sold over 50,000 copies of his book at 99 cents, putting the book at No. 3 overall in Kindle sales. Would he have gotten that far with a book priced at $9.99? Probably not since he wasn’t as well known or pushed by a larger house. But he will be able to command more for his next novel if fans like his stuff. Larger publishing houses have yet to implement this strategy to protect the market, but it’s a market that will quickly vanish for them if they aren’t willing to change. Smaller publishers realize that a smaller royalty percentage on 99 cents is better than a large royalty percentage of nothing – and they’ll happily take those numbers as they build a following for their new authors and sign more lucrative deals to keep them that the larger publishers refuse to do. At that point, good authors are choosing between wealth and a brand name. Who’s so vain that they will choose a name over a better deal? There will be some, but not enough to sustain the struggling industry. These are exciting times as the proliferation of eReaders is fascinating to watch. It won’t be long before every household will have at least one eReader, especially with the announcement of Amazon dropping its price further on the Kindle. We may soon see Amazon giving away a lower-tier Kindle just to sell books. And when smaller publishers don’t have to fight for shelf space or shelf placement – and can offer just as high quality books for a lower price – there will be nothing left to distinguish larger publishers from smaller publishers in the marketplace. Publishers’ roles are certainly changing — and marketing savvy authors may dispense with them altogether. But most authors still need help getting noticed and don’t want to do it themselves. Publishers who can adapt and fulfill that now all-important need for authors are going to be the ones that become the new large publishing houses, not the ones struggling to prop up massive infrastructure cost with a fiscal model that’s as broken as our government’s social security plan. Discuss: How are you personally responding to eBooks? 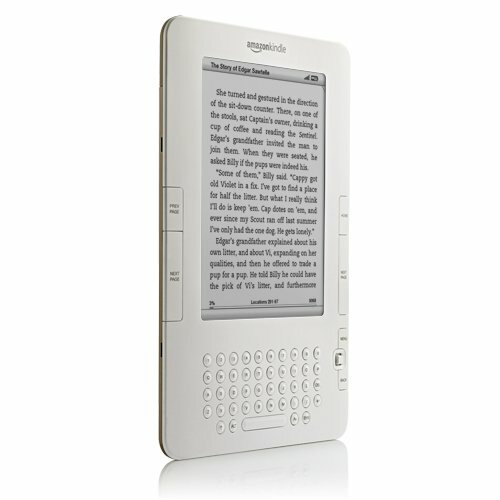 Do you have a eReader yet? Plan to get one if not? What drives your purchasing decisions?